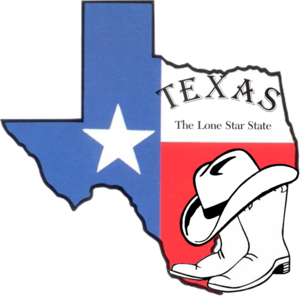 It was a weekend of firsts for Mr. T2S and me – our first trip to Texas, our first time teaching a workshop, and our first Texas BBQ! We enjoyed them all!! Everything in Texas seems to be a bit bigger, including the hospitality. Our weekend began with teaching a workshop. Eight fun ladies signed up to create the vintage style Christmas hutch with glitter houses. We had a great time assembling the houses and electrifying them. And I'm not embarrassed to say that I learned a lot from our students! Mr. T2S and I had just enough time to set up the table before the show preview. We enjoyed meeting new people and seeing the work of some of the top miniature artists. I even had a few moments to do a bit of shopping. I was happy to see Helen David. Since I was a young girl, I've admired her gorgeous flowers that are arranged so thoughtfully. A former florist, she pays special attention to the design and historical accuracy of the arrangements and the containers. 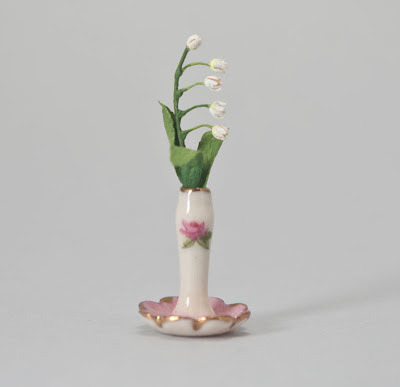 I treated myself to the tiniest stem of lilies of the valley. 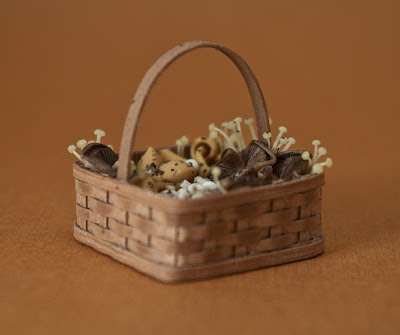 I also chose a basket of mushrooms from Autumn Leaf Studio. Even though Mr. T2S told me that some of the types of mushrooms are not appropriate for an Italian scene, I plan to use it in my Tuscan farmhouse anyway. Mushrooms by Autumn Leaf Studio. Basket by Al Chandronnait. 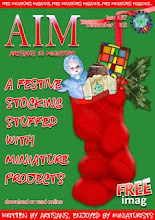 Tomorrow we are off to London for the Kensington Dollshouse Festival. We will share a table in the ground floor hall with Andrea Thieck. If you will be at the fair, please stop by and say hello! Carol!! You are having such an exciting time traveling all over and doing shows!! I love that you are going to do Kensington! I can't wait to read about it! !